Two volumes thick and 2,300 pages long, Samuel Johnson's Dictionary, published in 1755, marked a milestone in a language in desperate need of standards. No English dictionary before it had devoted so much space to everyday words, been so thorough in its definitions, or illustrated usage by quoting from Shakespeare and other great writers. Johnson's Dictionary would define the language for the next 150 years, until the arrival of the Oxford English Dictionary. Johnson's was the dictionary used by Jane Austen and Charles Dickens, Wordsworth and Coleridge, the Brontës and the Brownings, Thomas Hardy and Oscar Wilde. 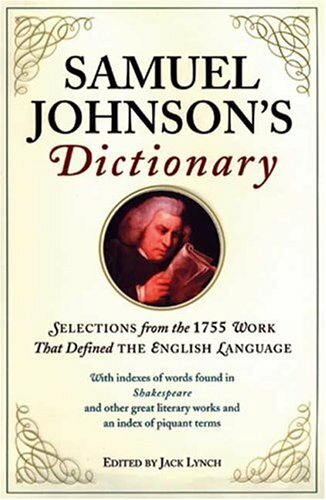 Modern dictionaries owe much to Johnson's work. This new edition, created by Levenger Press, contains more than 3,100 selections from the original, including etymology, definitions, and illustrative passages in their original spelling. Bristling with quotations, the Dictionary offers memorable passages on subjects ranging from books and critics to dreams and ethics. It also features three new indexes created out of entries in this edition: words found in Shakespeare's works, words from other great literary works, and piquant terms used in eighteenth-century discussions of such topics as law, medicine, and the sexes. Finally, Johnson's "Plan of a Dictionary of the English Language," seldom seen in print, which he wrote eight years before the Dictionary, is reproduced in its entirety. For those who appreciate literature, interpret the law, and love language, this a browser's delight―an encyclopedia of the age and a dictionary for the ages. If you have any questions about this product by Brand: Walker n Company, contact us by completing and submitting the form below. If you are looking for a specif part number, please include it with your message.